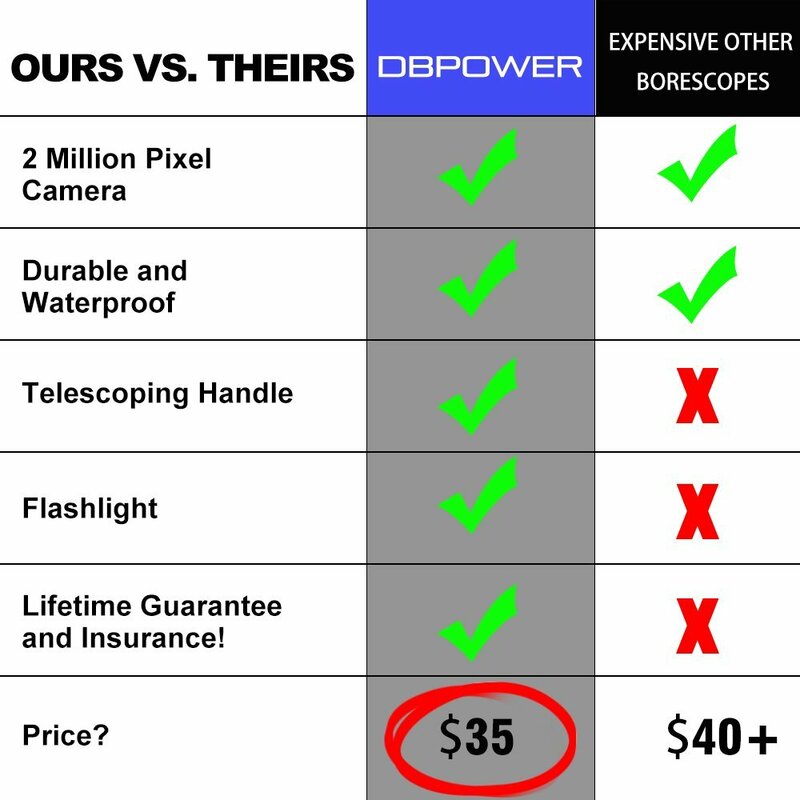 LIFETIME GUARANTEE – The DBPOWER WiFi Endoscope comes with a 100% Money Back Lifetime Guarantee. You won’t get this lifetime guarantee from other brands. Try It RISK FREE Today! HIGH RESOLUTION CAMERA – With 2 million pixels CMOS camera, GET HD IMAGES AND VIDEO WIRELESSLY! BUILT IN FLASHLIGHT – Equipped with powerful flashlight and variable LED lighting allowing inspections in dark locations. 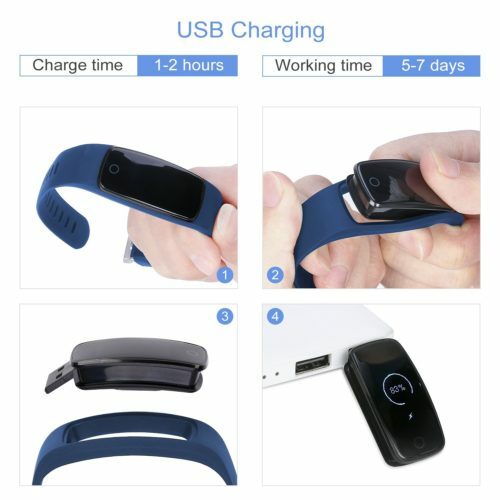 PERFECT FOR ALL – Work with Android smart-phone (Android 2.3 and above), iPhone/ ipad ( IOS 6.0 and above), Windows 7/8/10/XP/VISTA. 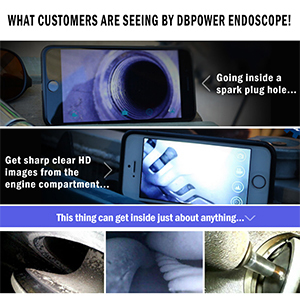 MULTIFUNCTION ENDOSCOPE – Great for auto repairs, home improvement projects, and various other tasks. It helps minimise the need to disassemble machinery for inspection, saving time and money. Users can view the videos in iPhones, iPads, Android devices and PC ,you can capture images(JPG) or videos (AVI) in VGK300k definition with the bundled application. 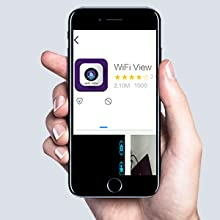 View live inspection video instantly on your iPhone, iPad, Android devices through Wi-Fi connection. 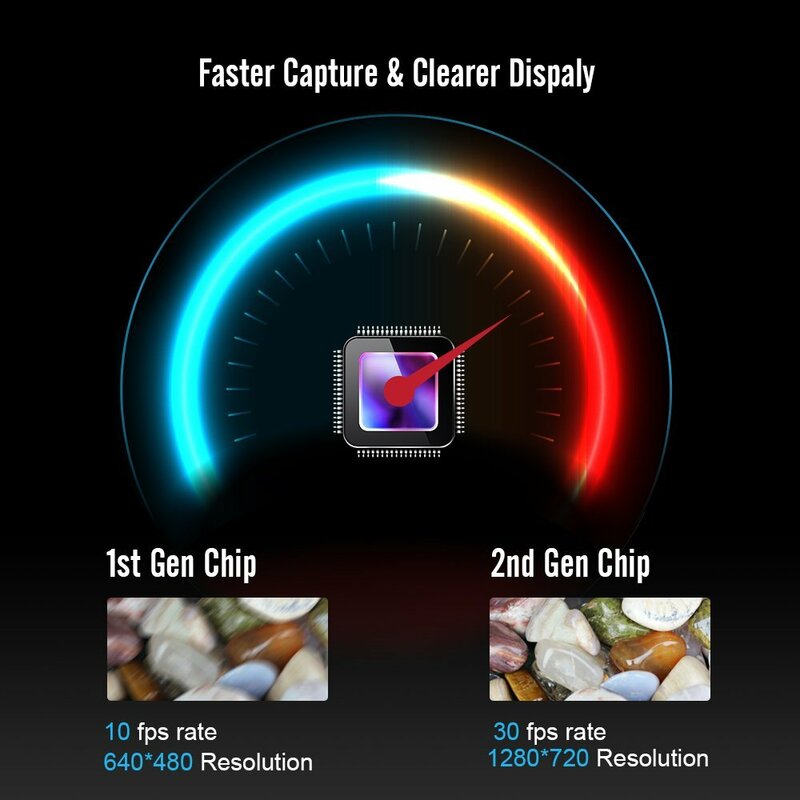 2 MegaPixels camera, with 2 million pixels CMOS camera, gives a clear and sharp full screen image. 8.5mm diameter slim sized Camera head with 6 LEDs in the tip. Equipped with powerful flashlight and variable LED lighting allowing inspections in dark locations. Download and install “WiFi View” app on your device from Google Play Store or APP Store. 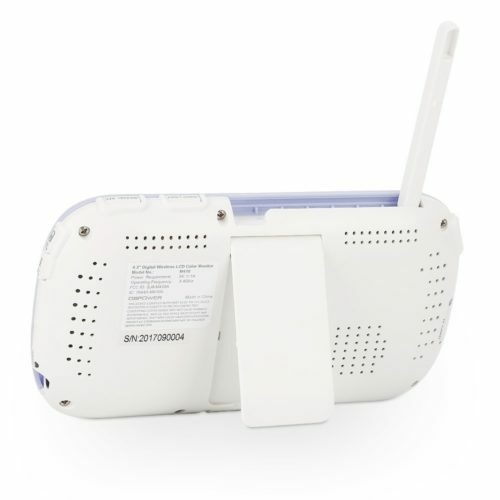 Turn on the WiFi box, open phone’s WLAN or wifi setting, find wireless signal named PLX_Camera(PLX camera), click it and input password “12345678″ to connect. Open the application for “WiFi View”, the image will be dispalyed automatically. Makes Your Phone A HD Borescope! Crisp clear images and video, a rigid water-proof cable, fully adjustable LED lights and a App for your phone make this a coveted item among gear heads! Cylinder Heads, Piston Crowns, Crank Cases, Transmissions, Rifle Barrels, Pipes, Walls and Vents and more! 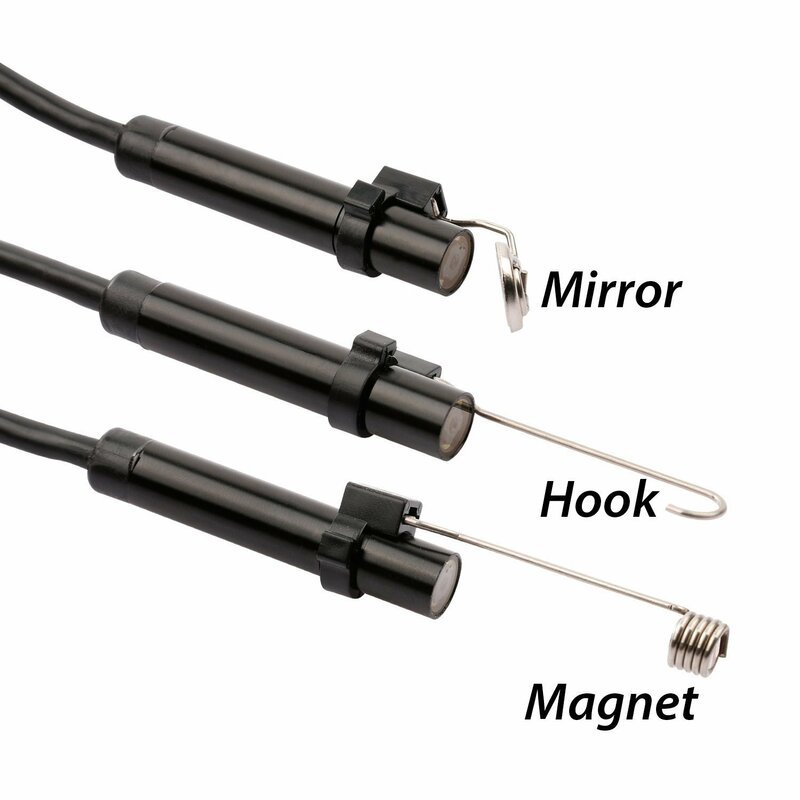 How to get a clear image with our endoscope camera? 1. Just like all cameras, we need to find the suitable light to observe the things. 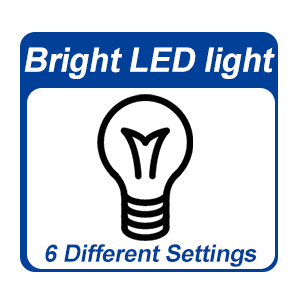 Please kindly note that remember to adjust the 6 LEDs to find the best lighting environment. 2. For our endoscope camera, it is featured with fixed focus, instead of zoom focus. 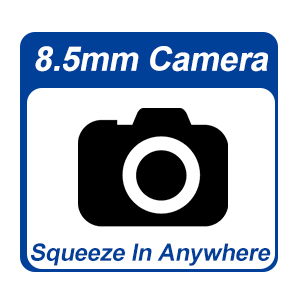 Therefore, in order to get the best image quality, the best observation distance is about 1.18Inch-3.15Inch, if too far or too close, it may both affect the image quality. 3. Keep the lens from shaking if you want to take a photo. 6 adjustable blue LED light on camera tip, it greatly helps to improve image brightness and clarity even in dark or low-light condition. The 6 LEDs are adjustable which helps to improve visibilty in dark or low-light areas. It is suggested to adjust them to be brightest when inspect in dark area. 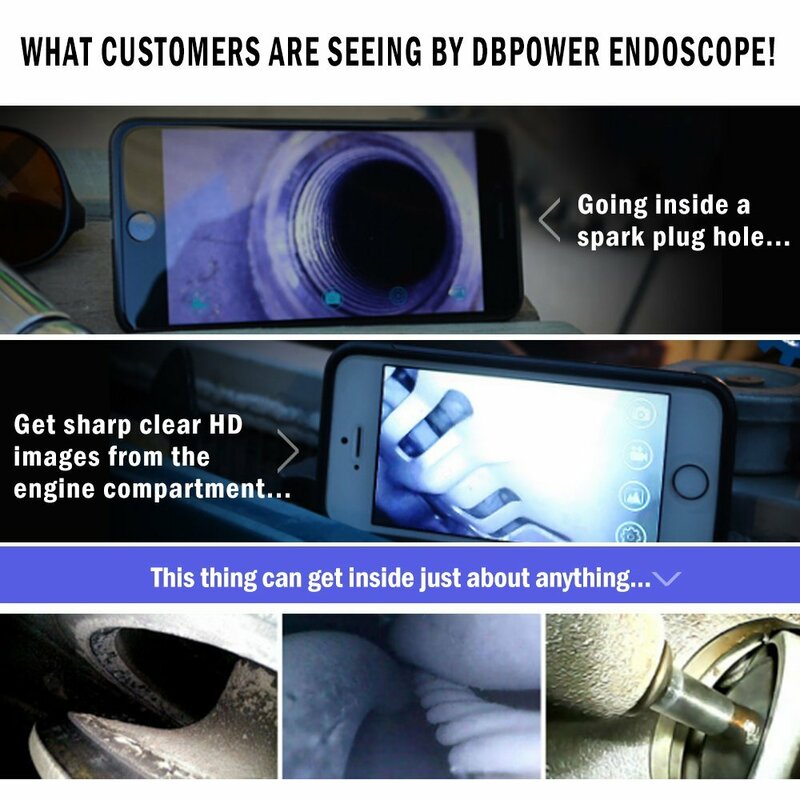 The DBPOWER Wireless HD BORESCOPE is an incredible optics tool for ANY job that requires you to “see inside” where you couldn’t see before! Our endosocpe equiped with 30fps rate to vibrate the captured images and recorded video which demonstrates fluent photo-taking and video-recording processes and fundamentally solves the problem like picture freezing or video delay from other brand products limited to 10 fps rate. 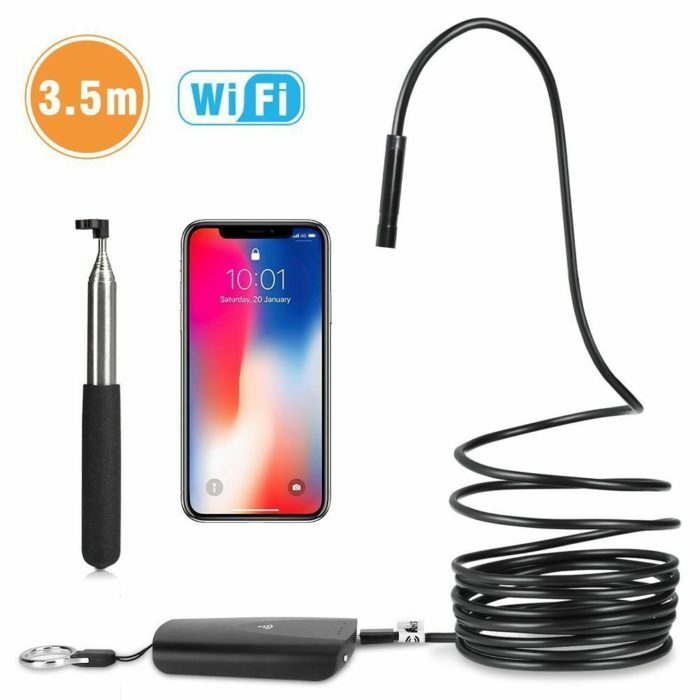 Has a Rigid Cable and a Shop Quality 8.5mm Camera: Turns your phone into a Borescope that makes expensive shop scopes look 2nd class! 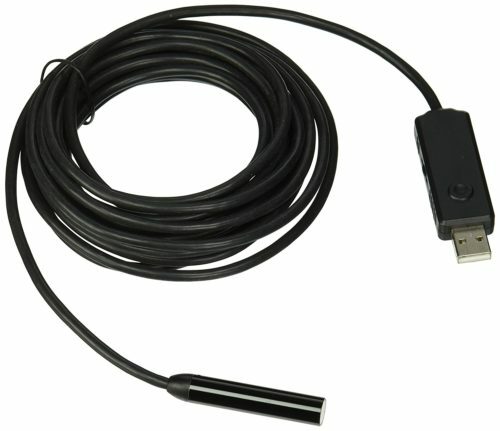 The highest video resolution of the endoscope camera is 1280 * 720. It is featured with fixed focus, instead of zoom focus, which focal length is 1.18-3.15inch. So a sharp image can be achieved within a view distance of about 1.18-3.15inch. If too far or too close, it may affect the image quality. Download and install “WiFi View” app on your device from Google Play or APP Store. 1. Connect the endoscope camera with WIFI transmitter by Micro usb port. 2. Turn on the WiFi transmitter by KEEP PRESSING Round Button for 5 seconds until red light flick. 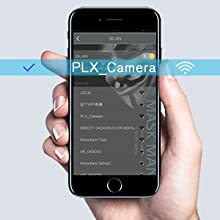 Open phone’s WLAN or wifi setting, find wireless signal named PLX_Camera (PLX camera), click it and input password “12345678″ to connect. Question: How do you turn the light on at the end of the scope? Answer: There is a little box on the opposite end of the camera with the light on/off and dimmer switch, so you have the ability to change the brightness to your likeness as you go! Answer: Mine came in a box not a case, but it had compartments for everything to go. It will work on all android device’s. Question: How do you charge the unit? Through the camera cord port, or the usb cable on back of unit? The directions are very poor. Question: what kind of battery? Lithium? Wireless option is the way to go! I wasn’t sure if I was going to like or need this when I purchased it since I already have one that plugs into my phone, but after I got it and started using it I don’t know how i worked without it. 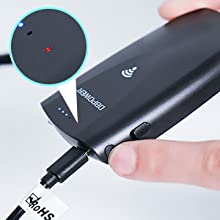 The wireless option adds a huge advantage now that I can view the image from my laptop or iPad without having to hold the device in my hand and juggle between the 2 I can now just concentrate on the camera and watch the video a lot easier! Must buy item especially if you work on cars! Goes where no man has gone before. Great for getting into really tight spaces. Got it for the engine compartment on big boat. Great for checking for rust and leaks. Item didn’t work for what I ordered it for (needed it to look down a pipe with a 45 degree angle…it wouldn’t pass the angle), but is still a very handy tool to have. Now this is really cool!! Want to look down your drain for the lost ring? Want to use it on your microscope for a video feed to your computer? This is very versatile and works for many applications. I used it to look in one of our cat’s ears to remove earwax!!! No I didn’t remove the wax with this, just let me see if her ears were cleaned!! Easy set up and worked as expected! Unlike others, this one worked!!!! I finally found an Endoscope that had sufficient quality that it DID NOT fail in the first 10 minutes!!!!! Previously purchased (and returned!) endoscopes sold by OVEHEL and BABY’s APPLES failed out of the box. 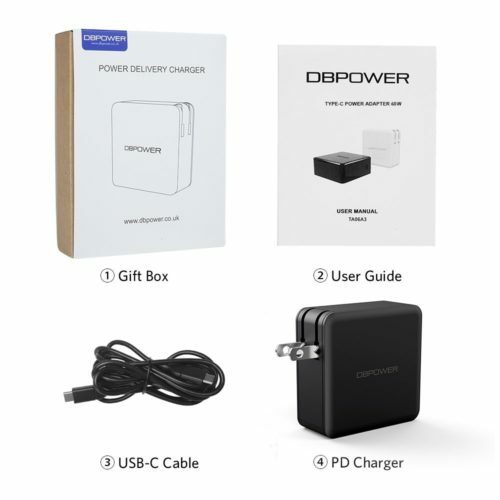 So, congratulations to DBPOWER for having a significantly higher quality product and actually providing a disk with the required software (that works!) for my Android Phone and Windows 7 laptop (both USB and Wireless Modes). I can give it 5-Stars because it worked as advertised. But, for plumbing issues, it did not even come close to the functionality of a professional plumbing camera because the focal distance, picture quality, and snaking capability. After several weeks getting a functional endoscope, I still had to get a plumber to fish the debris out of the toilet line with his $8,000 rig…. 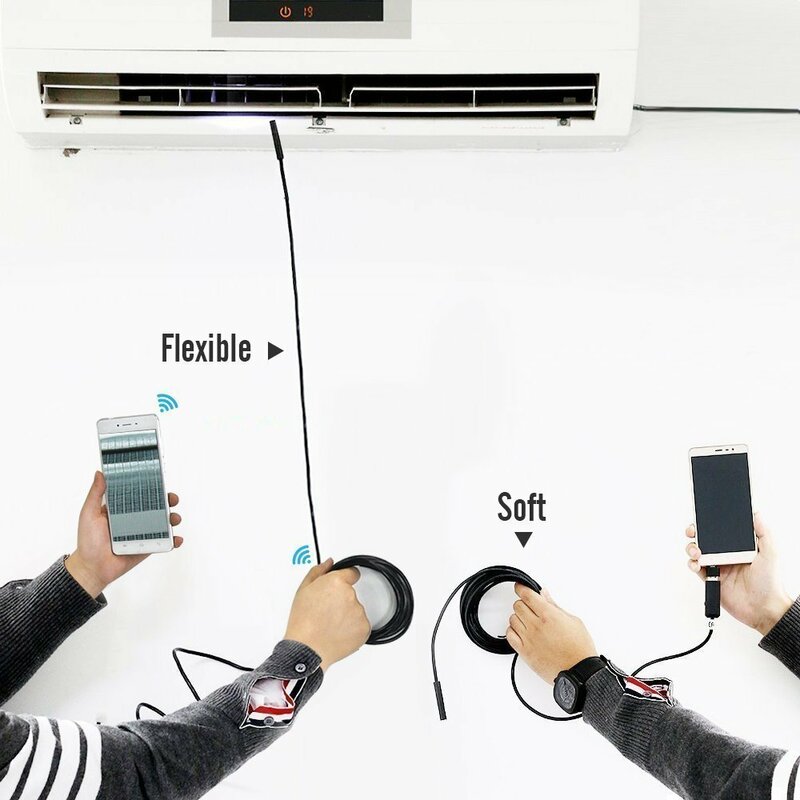 Works as advertised and shown, except for the cable: it is not rigid AT ALL and is totally soft and flexible (picture the flexibility of a really flexible USB cable, just a little thicker). I’m using a Samsung S7. Mo-View app mentioned in camera manual works well for connecting with WiFi box. The OTG app they recommended doesn’t exist on the Google Play store and entering the URL manually results in a broken/missing link. I plugged the micro USB camera directly into my phone, used the “OTG View” app, and am able to take photos and videos. The app works well (if your phone supports OTG). It works well it was not hard to get to work with the computer. 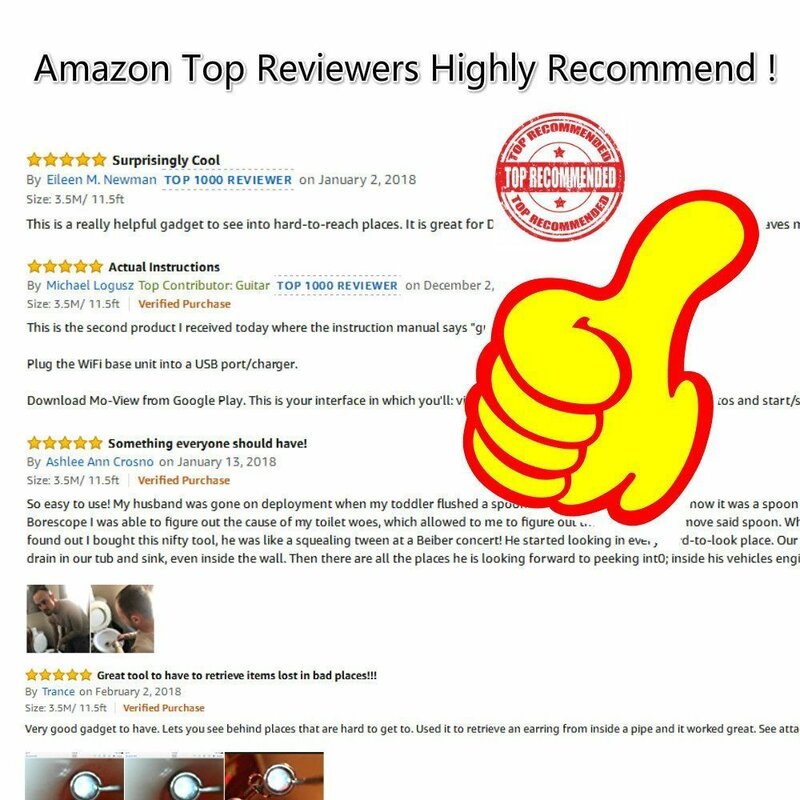 The only reason I gave it 4 stars is because it doesn’t go around bends. Tried the product to see how it worked and the results are good. The instructions are listed in a tiny, tiny book with small font. Hard to read, This is the only negative so far. Works good. I couldnt find my ID so I used this camera to look down into my truck console before I tore it up. Turns out it was down there and the scope showed me. Then I tore it up but it wasnt for nothing. 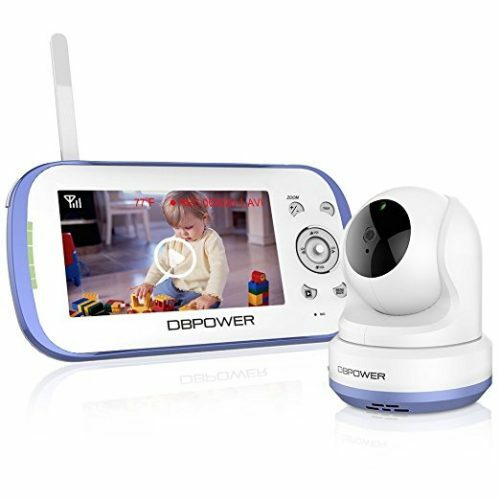 This is a very nice tool, you need to download the app, and use wife to contact this camera, then you can see camera vision on your smartphone. You can recording videos, taking picture through the app. This is good to use when you work on something or fix something at a tiny space, you can use this camera to check different angle. I actually bought this for my boyfriend to use for work. He has a truck that he is always working on it seems. There are a lot of hard to reach areas so I thought this could help him. I wanted to check it out first though. I found it was super easy to set up & start using right away. The picture is clear for such a tiny camera and you can even record video. It came with a few useful attachments for the end (hook, mirror, & magnet) and also a telescoping handle. I only wish the cord was stiffer. The handle is nice but it’s only about 3.5 ft so beyond that it may be harder to maneuver. 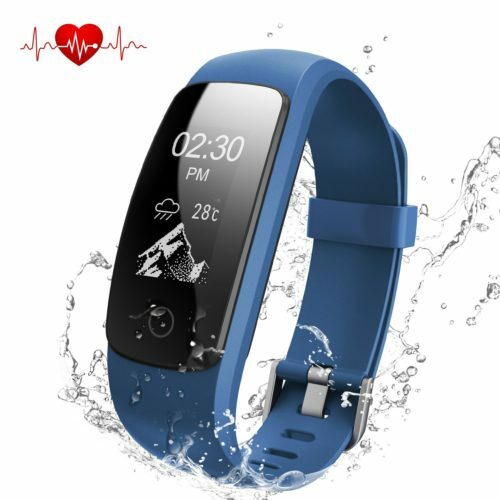 Nice product and it comes with a lifetime warranty! 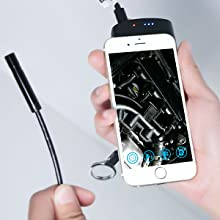 I had bought this for my boyfriend who is always working on his car and trying to see in to lots of small dark places, normally there is a lot of cussing going on. This past weekend he needed to clean some sort of cylinder out and had used this and was so excited, it cut his project time down in like half! I purchased the 10m one so he wont have any issues with not having enough slack, love the accessories that came with as well. The hook in case you need to fish something out of the drain is probably my favorite in the package! 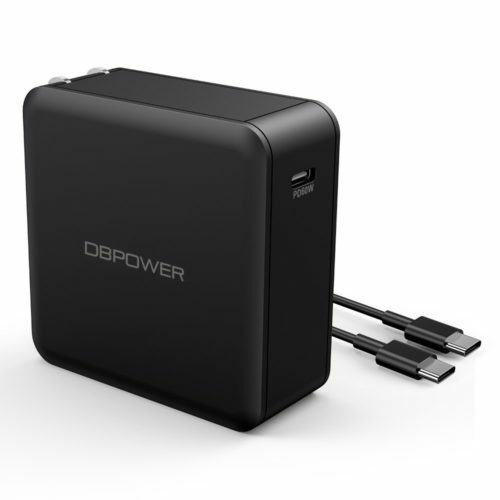 I think its awesome there is an app to go along with this, think it would be a cool idea to be able to hook the camera directly up to my phone to use instead of the small power pack that is included. OVERALL if your contemplating, I say GO FOR IT! So heres the thing, i gave this to my husband for him to be able to use. He said he dont need it. I said okay fine. And then the next day he accidentally dropped his ring on the back of the TV stand and he wasnt able to see it, or which part did it go. He then came to me and asked if he can use it lol. From there he loves it 🙂 the flashlight is great and the camera is great too. We have a computer and camera installation company. We used a much smaller version of this but it had its own hand held (small) screen. 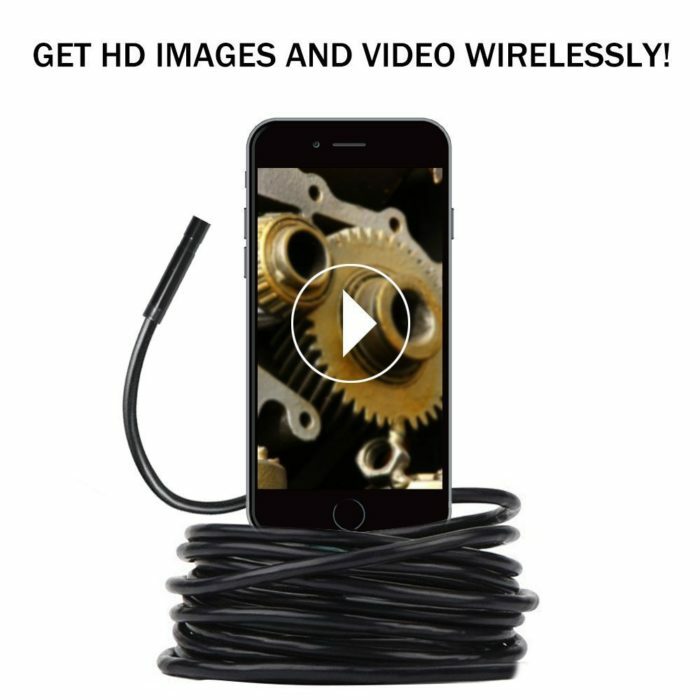 We needed a camera that would snake further down a wall (longer cable) and my search led me to this one that would also connect to our large screen iPad. We were very amazed after the first time we used it. It has a very clear picture and easy to maneuver. 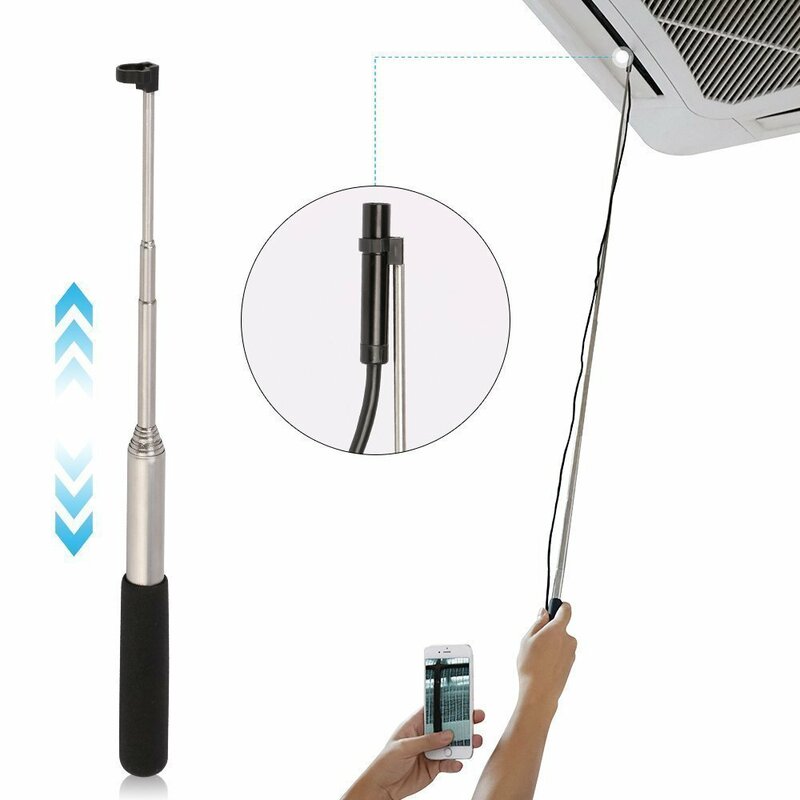 The telescoping pole helps to guide the camera through tough areas in the wall with thick insulation. We got the 10M length and it allows us to go further at one time. Our employees said it saved them time on the last job they did. Great product and easy to use. I wish that I had even known something like this was available. This tool would have been so helpful last year, before we dug a trench in the front yard looking for a broken pipe. The applications for this are endless as avid DIYers; We planned on moving some light fixtures and my son is forever working on his car – no more dangling flaslights from string and straining to peek through crevices. I’m so grateful I found this. Game changer!!!! Have you ever dropped something into a small space and you can’t see to be able to retrieve it? Not a problem anymore with this tool! 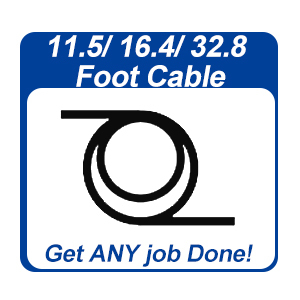 The cable is super flexible and comes with a telescoping handle to help hold it. The software needed is a free and simple install. You can be up and running in only a few minutes.